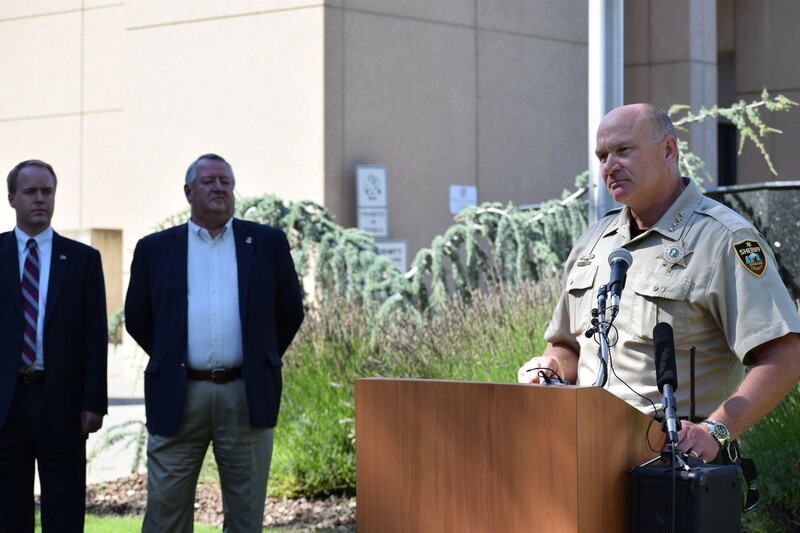 Spokane County Commissioners Josh Kerns, left, and Al French listen to County Sheriff Ozzie Knezovich speak at a press conference last month. Spokane County Sheriff Ozzie Knezovich says that his department will likely lose a dozen deputy positions next year as a result of proposed countywide budget cuts. "We've been told to reduce by $1.3 million," Knezovich tells the Inlander. "We have nothing left to cut." Last month, facing a $10 million budget shortfall, Spokane County commissioners asked every department supported by general county revenue for cuts of 7 percent. Commissioners Al French and Josh Kerns also announced that they would not ask voters for a property tax increase — just months after deciding to put it on the ballot in the first place. For Knezovich, that meant one thing: public safety would be sacrificed. He says that unless county commissioners figure something out before the budget is finalized at the end of the year, the sheriff's office will lose roughly 12 deputy positions and two patrol districts. The sheriff's office is currently struggling to fill 14 positions as it recruits potential applicants. So right now, Knezovich says, cutting 12 deputy positions wouldn't result in any deputy layoffs, only the inability to fill positions. But he warns that by cutting those positions and eliminating patrol districts, response times to emergencies will suffer. "We've been pulling rabbits our of our hat since 2010. There are no rabbits in our hat this time." He adds that the sheriff's office has never recovered from losing 30 deputies due to budget cuts seven years ago. Since then, he says the sheriff's office has been underfunded, with county commissioners choosing not to ask voters for tax increases to fund public safety. "My budget has been cut every year. They've underfunded the sheriff's office every year since 2012," he says. "I've had to go to war with the budget office to say, 'We're underfunded. Unless you want me to lay deputies off, you have to fix this issue.'" Instead, he says, the sheriff's office has barely received enough money to scrape by. And when county commissioners held a press conference last month to again push back a proposal for a property tax increase, Knezovich didn't hide his frustration. "This will be the last time that I stand in front of the public and tell the public that we'll bump it one more year," he said, later adding, "We're not providing you the public safety that you deserve or that you need." County commissioners have blamed unfunded mandates coming from the state, along with a flawed funding model for counties in Washington, for the budget shortfall. The ballot proposition they took off the ballot would have lifted a lid on the amount by which the county could raise property taxes, allowing it to increase taxes by up to 25 cents per $1,000 of assessed property value if approved. But Commissioners French and Kerns decided against it after the state legislature's budget called for its own increase in property taxes for county residents in 2018. Instead, the county announced a partnership with the city of Spokane to find ways to reduce the budget, particularly through streamlining the criminal justice system. Spokane County is hosting a series of public forums before voting on the 2018 budget this December. There are two public outreach sessions this month, at 5:30 pm on Sept. 19 and Sept. 26 in the Board of County Commissioners Hearing Room, 1026 W. Broadway Ave. Those will be followed by two budget proposal presentations on Oct. 2 and Oct. 4. Knezovich says public safety should be the top priority. If not, he says, this time he will have no other choice than to cut deputy positions. "We've been pulling rabbits our of our hat since 2010," Knezovich says. "There are no rabbits in our hat this time."